Fuquay-Varina is a small town in southern Wake County that is known for the mineral spring that has historically been a tourist attraction. Fuquay-Varina was formed during the merger of Fuquay Springs and Varina so the town actually has two downtowns, which contributes to its unique sense of place. Due to the town’s relative proximity to research Triangle Park and Raleigh, Fuquay-Varina’s population more than doubled between 2000-2010. Fuquay-Varina’s involvement with the Watch for Me NC program has continued to grow since it joined as a pilot community in 2013. The Fuquay-Varina Police Department and Planning Department are the lead agencies for the town’s Watch for Me NC program. Other program partners in Fuquay-Varina include the town manager’s office, local businesses, and seven area schools: Fuquay-Varina High, Fuquay-Varina Middle, Lincoln Heights Elementary, Fuquay-Varina Elementary, Balentine Elementary, Herbert Aikens Elementary, and Banks Road Elementary. Fuquay-Varina has been successful in spreading the Watch for Me NC campaign message through a variety of local events, educational presentations, and enforcement operations. Annual school events, such as a Back to School, have been especially popular and a Safe Routes to School campaign is currently in the works at one local elementary. In addition to outreach for school-aged children, campaign partners have participated in meetings with local cycling groups and have presented at Town Board meetings. The Fuquay-Varina Police Department also spreads the Watch for Me NC message online by staying active on social media sites including Facebook, Twitter, and NextDoor. Enforcement operations have focused on issuing warnings to motorists and pedestrians. Officers primarily conduct enforcement operations at mid-block crossings near seven area schools and both downtowns. Fuquay-Varina Police Department have made it a point to spread the Watch for Me NC message via enforcement by distributing brochures during operations and announcing operations on social media. The police also recognize safe road behavior by issuing “caught being good” tickets. For example, officers have given free frozen yogurt and cookie coupons for exhibiting safe road behavior. One of the key outcomes in Fuquay-Varina is an increased awareness of pedestrian and cyclist safety issues among police officers, as well as an increased awareness of Watch for Me NC campaign messages among the local community. The town’s Police Department has been remarkably active on social media, often posting Watch for Me NC messages or campaign press releases once a month. In terms of policy impacts, the Watch for Me NC program is mentioned in the town’s 2013 Community Pedestrian Master Plan as a program that the Police Department should stay active with in terms of training and outreach opportunities. Moving forward, Fuquay-Varina’s partners want to conduct bicycle rodeos with free helmet give-aways led by certified bicycle patrol officers. Institutionalize the program: Incorporate Watch for Me NC activities into normal operations and annual events for best results. 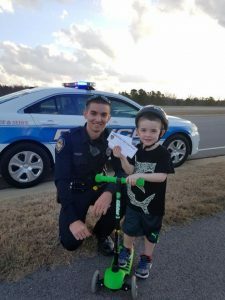 Stay active on social media: Fuquay-Varina’s Police Department not only posts pedestrian and bicycle safety messages on a variety of social media sites every month, they also post photos of officers engaging with the community. This helps spread the Watch for Me NC message and show real connections between the police and residents. Thank you to Lieutenant Scottie Hinton of the Fuquay-Varina Police Department for providing leadership to the Watch for Me NC campaign and contributing information for this profile.